1. An arts council in Bethesda has cordoned off a small block, erected a screen, and set up chairs. We spend the evening watching The Princess Bride. 2. As we’re speeding to the Monkees concert on Sunday, we race past ballroom dancers performing in Freedom Plaza on Pennsylvania Avenue. And as we were on on our way back from a Shakespeare performance that never materialized, we happen upon a percussion ensemble, Polyphonic Marimba, performing in a triangle park in our neighborhood. 3. The heatwave breaks and I emerge from the Burrow this morning to temperatures in the upper 60s. We turn off the a/c for the first time in a month. Category: three beautiful things. There is/are Comments Off on cordoned off, surprise street acts, and break. I’m still reading and knitting the same things I was two weeks ago, although I’m further along with all of them. I’m working the second panel of six or seven, now. 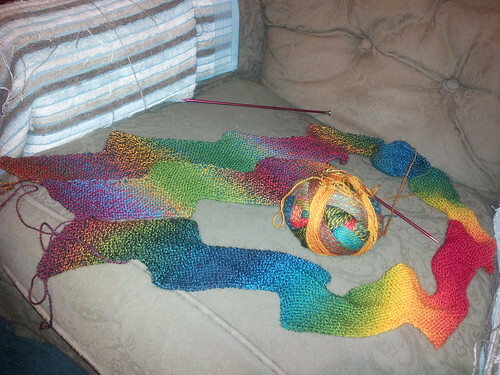 It’s slow going, but isn’t too difficult, except for making sure that I don’t shortchange myself rows. I’m still reading Just One Day and A Monstrous Regiment of Women, although I’m now 2/3 and 1/3 through them, respectively. I’m enjoying both books, although they share little in common thus far, except maybe a desire for self-determination on the part of the main characters. I’m also listening to Penny Marshall read her memoir, My Mother Was Nuts. The beginning was a little confusing, but became less so when I took my iPod off of its shuffle songs setting. I was having such a hard time understanding why her friend was doing heroin in middle school… When listened to in correct chapter order, the narrative is laugh-out-loud funny, and Marshall’s delivery is done in her trademark deadpan. The book needed a stronger editor (there’s a lot of unnecessary repetition), but so far that’s my only complaint. Now that I’m not watching hours of Tour coverage every night, I expect my reading will pick back up again. 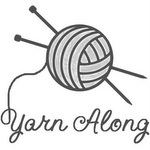 Check out what others are knitting and reading at Ginny’s blog. On Friday night, we joined John and Nicole at The Yards for a picnic in the breeze off the water. Kids shrieked as they ran through the pool and we could hear the band off in the distance. On Saturday, our lazy day of the weekend, we watched the penultimate stage of the Tour de France live, rather than a rebroadcast. I knit on my shawl and did a load of laundry. We went to Glen’s Market for lunch, then biked down to the garden to water. We finished the day by picking up Sarah and her friend Allison for some tailgating before a concert up in Maryland. It was Fun., with Tegan and Sarah opening for them. The crowd was upbeat, liberal, and young, and the venue was packed. Fun. said that it was the biggest crowd they’d ever played before, and they seemed a bit awe-struck at the power they wielded from the stage. Their show was energetic, and so was the twice-soaked crowd after two waves of rain poured down on the lawn seats. On Sunday, there was the farmers market. There also was DC Scoop, an ice cream festival at Union Market. 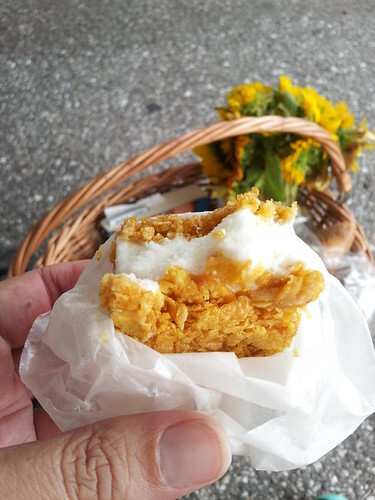 I spent the entire afternoon there, shopping at the various vendors inside and out, and then biked home with two pints of raspberries, a (mini) baguette, and a bouquet of sunflowers in my basket. I would have felt quite Parisian if I’d had a chance to pedal leisurely. Instead, I raced against a thunderstorm that never materialized into rain, leaving me sodden from the effort and the humidity. That’s a Davy Jones-less (obviously) Monkees. They goofed around, they sang hits and deeper cuts (Rudi was particularly pleased to get seven songs from Head. ), and they interacted with the audience. I thought the show might be a bit somber, but it wasn’t. 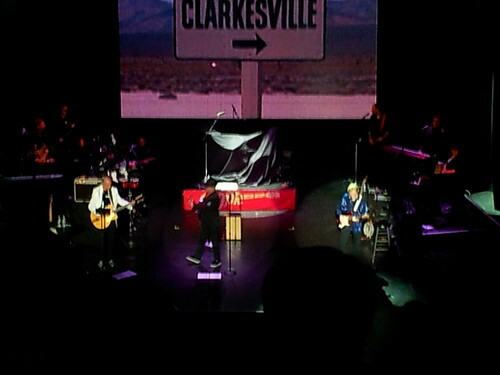 It was just a lot of fun and filled with people singing along to songs they’ve loved for decades. Category: arts,dc life,life -- uncategorized. There is/are 2 Comments. 1. On Sunday, we headed up to Delaware to the beach. We spent the entire afternoon soaking up sunlight, playing in the waves, and generally relaxing. Then we decided to follow it up with a movie at an independent, single-screen theater (which opened in 1949), which was showing The Lone Ranger. 2. The stars were ultra-bright while driving home from the beach. Living in a city, you forget how bright stars can be and how many of them there are. Depending on the road’s direction, I had a view of either Cassiopeia or the Big Dipper. 3. After more than two straight weeks of being sick with some bug that I just couldn’t shake, I woke up Tuesday feeling fine. 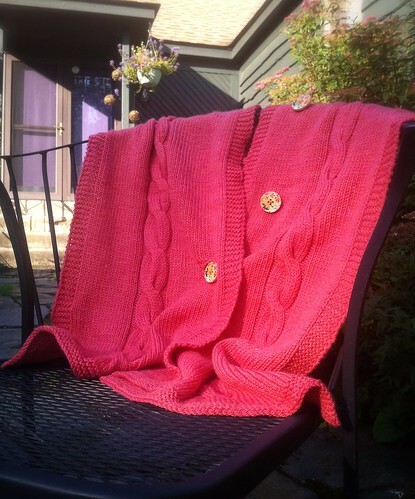 My grandmother turned 92 back in March and, unable to think of a better gift, I decided to knit her something. My mother recommended a shawl, saying she was often trailing one of the other shawls she owned behind her walker. 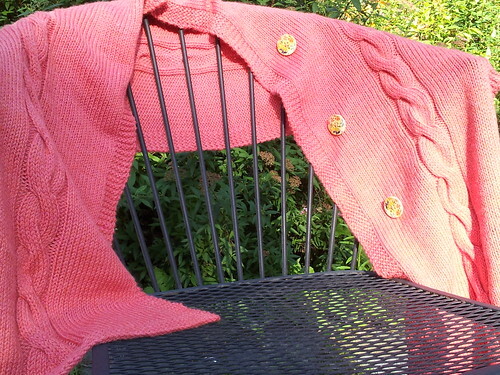 I thought that a shawl that buttoned might work and Ravelry offered me suggestions. 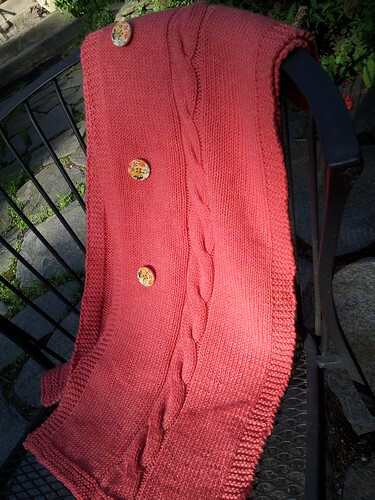 The pattern I picked is Erika Flory’s Cabled Button Wrap. I knit it in worsted Shepherd Wool in Antique Rose, a sort of corally color that’s hard to photograph well, using slightly less than 2.5 skeins. We all thought I’d get it done quickly. That didn’t turn out to be the case. But, then, a couple weeks ago, my grandmother had another health scare and I thought, I am going to be so annoyed with myself if she dies and this stupid thing is still on the needles. So I finished it and blocked it, all in advance of heading up there last weekend. Everything except for buttons, which I couldn’t find a combination of right size and beauty. 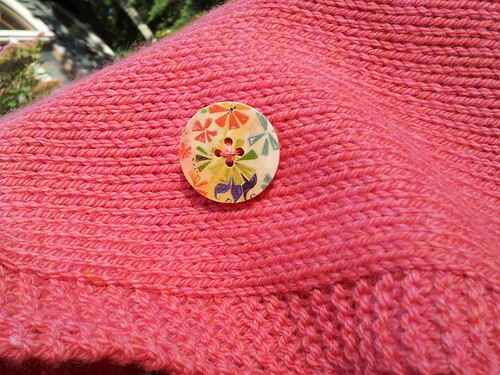 The shawl has three buttons and only one buttonhole, offering several ways to wear it. But as long as one of them keeps the shawl on her, so it’s not dragging behind her, I’ll consider it a success. I knit several extra repeats and the total length was a few inches longer than my 55″ blocking mat. I can offer you no modeled shots because one doesn’t ask a very senior citizen to do a photo shoot of woolenwear during a heatwave. At least not one you like. Category: knitting. There is/are 3 Comments. 1. An old friend lets us know he’s coming to town suddenly, just before we’re due to depart for the weekend. We leave work early and meet him for lunch, which turns into a relaxing four-hour recap of life, family, travels, and mutual friends. 2. When up in Connecticut for a weekend, the original scope of the visit seems all too short. Our respective bosses give last-minute permission for a extra day of leave so we can spend a little more time with my family (also allowing Rudi some time for cd/dvd shopping). 3. Volleyball on Wednesday is played in sweltering, pregnant* conditions. As I creep home afterwards, soaked in sweat and under darkening skies, I think, anytime after I get home it could start raining. Not ten minutes later, the storm rages into the area. I walk back outside and stand on the stairs as a cool torrent of water pours over me. * The atmosphere, not me. Category: three beautiful things. There is/are Comments Off on lunch, one day more, and relief.